"Two separate databases were created to organize the findings of this research and both are available to the public. The first discovered nearly 5 times the 70 or so potential reactions that are listed on the average drug insert." 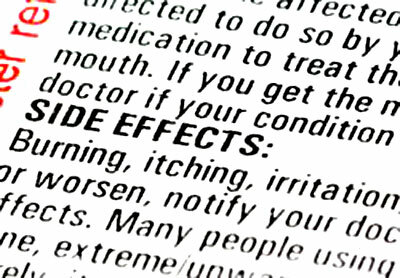 Prescription medications usually always carry a rather frightening (and long) list of possible side effects. These drug side effects may range from mild symptoms like headache or nausea to more serious risks such as seizures or temporary blindness. New research suggests that the side effects listed on the label often represent just a small portion of what users are really experiencing. Most new prescription drugs undergo extensive testing in laboratories, often on animals, before being the center of a variety of clinical trials among closely monitored patients. While these studies are generally very thorough and are the most reliable way to prove that a medication is safe and effective, clinical trials could not possibly foresee all of the potential effects the drug could have on individuals with different underlying conditions and medical histories. Many times, the most serious side effects are not acknowledged until after the medicine has been on the market for quite some time. Once a drug is approved by the FDA for specific treatments and medical providers begin to prescribe the medication to their patients, it is not uncommon for many other adverse effects to emerge. Unfortunately, it’s not always easy to determine if the symptoms are a direct result of the medication or if other factors are also to blame. All of these reactions and side effects are added to more than 4 million similar reports in the FDA Adverse Event Reporting System database. Until recently, no one had devised a logical method to analyze and filter the data. A team of researchers from Stanford University School of Medicine have developed such a system. Using a computer generated algorithm, graduate student Nicholas Tatonetti and Stanford professor Russ Altman, MD, PhD sorted the millions of reported side effect cases within the database to group together patients with similar lifestyles, medical histories, and/or prescriptions. This process makes it easy to determine the cause of the side effect or reaction, and is also a great way to learn more about adverse drug interactions that may not yet be acknowledged. Two separate databases were created to organize the findings of this research and both are available to the public. The first, OFFSIDES, discovered an additional 329 side effects on average for each of the 1,332 drugs that were studied – nearly 5 times the 70 or so potential reactions that are listed on the average drug insert. The TWOSIDES database relates to drug interactions and is based on more than 50,000 possible medication combinations. An additional 1,301 contraindications were discovered. One of the most important findings is a previously unknown risk of fatal cardiac conditions in patients taking SSRI class antidepressants at the same time as a commonly prescribed blood pressure medication. While the results of this study are quite alarming, this method of analyzing data will be very beneficial to the medical industry as well as the patients taking the drugs. It may take several years before many of the newly discovered side effects and interactions are mandatorily included in the medication packaging, but doctors and their patients can use the knowledge to determine the most effective prescription combinations for the specified conditions.